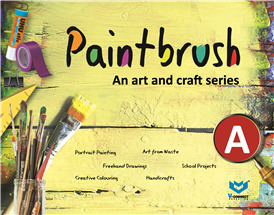 Paintbrush, a set of 1o books for Pre-primary to classes 8 (A,B,1 to 8) is a graded art and craft series. It is based on the premise that experiencing art and craft during school years gives students the avenue to nurture creativity. The series helps develop the cognitive, affective and psychomotor abilities of every learner.